Propsummit.com a Blade Runner Prop Community Forum BladeRunnerProps.comView topic - Blade Runner 2049 Memorabilia...Pop! Vinyl, Dorbz, etc. Posted: Thu Aug 17, 2017 5:28 am Post subject: Blade Runner 2049 Memorabilia...Pop! Vinyl, Dorbz, etc. Due to hit the stores on the 10th September, Funko have released pics of their BR 2049 range of Pop! Vinyl and Dorbz. There are also some groovy t-shirts in the pipeline. I particularly like this one from CID Merch. Never imagined we'd see so much memorabilia and it's very early days. Heck, they had 32 years of prep. So far the merchandise has been pretty tepid. Those Neca figures and now this. On the plus side, there's an updated version of Future Noire out on 13th September. Wondering when / if the "Art of Blade Runner 2049"-type of quality publications will be released. "The Art of Blade Runner 2049"...that would be a bonus for sure. Indeed. What's been released so far is for a demographic that is too young to even attend the film, much less be interested in it.. I am really losing my enthusiasm for collectables. Especially these things made only as collectables and sold at a mark up. I plan on buying the updated Future Noir, if only because I can now call Paul a friend. If an art book ever comes out, that is also a must have. I know they looked into making one for the 25th anniversary set, and instead they a tiny book, and DVD art gallery for the 30th anniversary BluRay set. A bit of a let down. I guess most of the stuff is already been published, or wasn't archived the same way other films had. All I can say is that for some reason, I fully despise the Funko Pops. I still will collect stuff from the original film, but I am no longer a completist. The scalpers and speculators have ruined that part of the hobby for me. If Neca does figures based on the first film, or models of the original film cars, all bets are off though. I totally understand, andy. At some point, I'm going to have a major purge of most of my collectables. The pieces I treasure are largely fan-made. If Sideshow or Hot Toys started a 12" range of original figures, I'd jump. Hopefully, there will be some high end replicas and quality publications down the line. 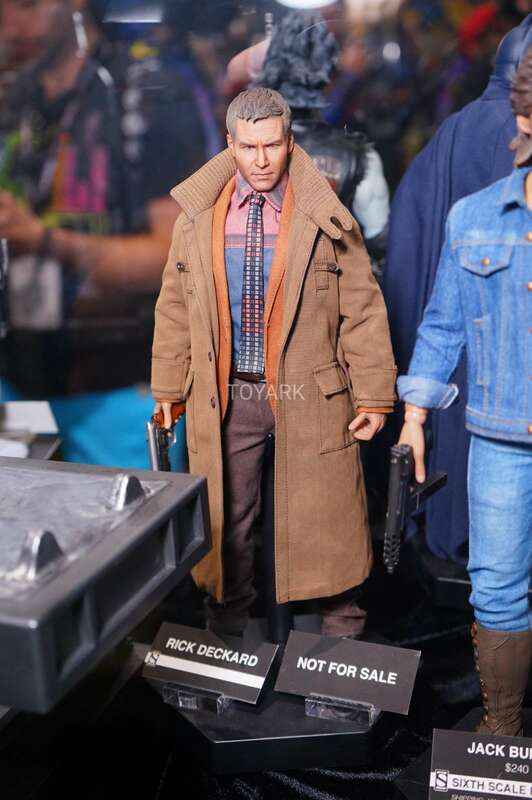 Sideshow had a Deckard figure on display at SDCC 2017, but it was marked "Not For Sale". Apparently, the staff at the Sideshow booth said this was a one-off passion project.